The Common Core State Standards have raised the bar significantly for all K-12 students in the United States. They now must acquire a broader range of academic skills than was required previously. The raising of the bar for students means that the bar has also been lifted for educators. Teachers and administrators must produce better-educated students. It's not an option . . . it's the law. Throughout the country, educators are under intense pressure to implement the new standards, but it is not easy. Although the standards provide clear objectives and guidelines, they do not mandate specific programs or texts. Hence, districts and schools are left to their own devices to find the answers. Today, countless vendors are offering solutions, but in my humble opinion, nobody comes close to offering what Great Books programs offer. 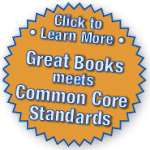 For fifty years, decades before the Common Core State Standards were even conceived, Great Books programs have promoted many of the skills embodied in the standards. The widely acclaimed Shared Inquiry™ method of learning, with its emphasis on critical thinking and world-class literature, reflects keys goals of the new standards. These are the very skills set forth in the Common Core State Standards. And these are the abilities that result from implementing Great Books programs in the classroom. In fact we align so closely to the new standards, that many educators have asked us if we helped write them. (For the record, the answer is no.) We didn't catch up to the new standards, they caught up to us. Mitch Gurfield is a sociologist, writer and educator. He was born in New York City and received a B.A. from the City College of New York and a Masters and Ph.D. from the Graduate Faculty of the New School for Social Research. For nearly twenty years he taught sociology atvarious colleges and universities in New York and Massachusetts. During this time, he also carried out research in Brazil and wrote two books on the country. Since 2002, he has worked as a Senior Consultant for The Great Books Foundation.